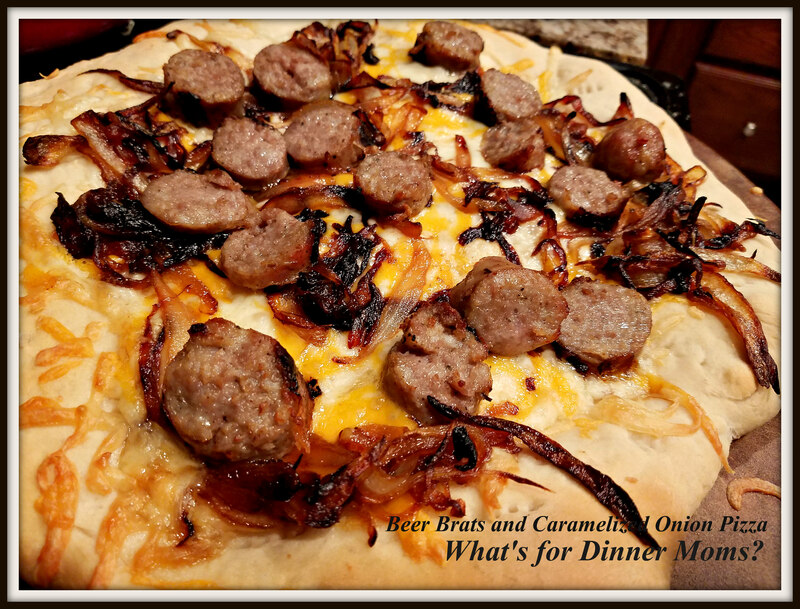 Beer Brats & Caramelized Onion Pizza – What's for Dinner Moms? Taking those things we love and turning them into something new for us! Brats are always on sale here and with the Super Bowl a few weeks ago sales were really great. I picked up a few packages to have on hand because they are like the hot dogs of the Midwest. If you read my blog fairly regularly you know I LOVE caramelized onions. 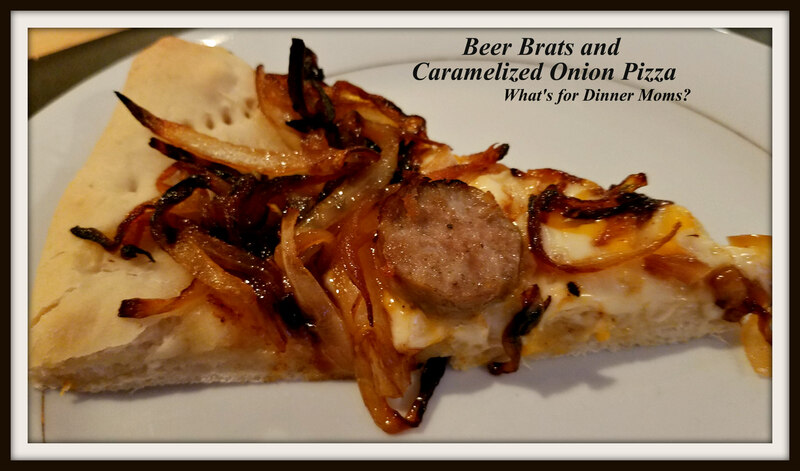 The sweetness, the savory taste is just perfect with a nice beer brat. We were out of rolls so what do I do? Improvise! Lets make this into a pizza! This was delicious! I went simple with a brush of olive oil and a sprinkle of powdered garlic across the crust before baking it for about 4 minutes. Then I put the cheeses on the crust with the sliced beer brats and onions over the top. This was gone by breakfast the next morning. I made a small pizza for my daughter without the onions on it and she was happy too. We are already thinking of making this dish this summer on the grill. Oh my yum!!! In a large skillet over medium heat cook the brats in the beer and water. Pierce the brats to soak up the beer as they cook. When they are fully cooked remove them to a plate to cool. Slice into small circles once cooled. Add the butter to the skillet and lower the heat to medium-low. Add onions to the pan stirring well. Cook over medium low heat for about 20-25 minutes until onions turn dark brown. Be careful not to let them burn. Remove pan from heat when they are done. Spread dough out into a large circle on your pizza stone. Brush top with olive oil and sprinkle garlic powder over the top of the dough. Pierce dough with a form all over the top to prevent it from over rising. Bake for 4 minutes until set. Remove pan from oven. Sprinkle the top of the pizza with mozzarella cheese, cheddar cheese, then onions and top with sliced brats. Bake for 10-12 minutes until bottom of the crust is golden brown and top is browning. Remove pan from oven and allow to sit for 5 minutes before slicing. So delicious idea for pizza! Sounds very good! I would love to try it but what about that beer taste. I don’t think there is much alcohol left but I don’t like beer at all. Does the bratwurst taste a lot like beer? You can leave the beer out and just cook it in water. Bratwurst is a German sausage made of beef, veal or commonly pork. These are actually beef. We cook it in beer because we like the tangy flavor (yes, the alcohol cooks off). But, if you don’t like beer just grill it or pan fry it with a bit of water. Hope this helps! Oh, good, when it doesn’t affect the recipe too much I will leave the beer out. I know, bratuwurst very well. We are having it over here at every festivity. It is basically not only a German sausage but most popular in all the German speaking countries like Austria, Switzerland, Liechtenstein too. The original one is a white sausage. There are many different bratwurst recipes depending on the country it originated from. This all just on a sidenote… lol. Bratwurst is my favorite sausage btw. 😋That’s why the recipe spoke to me right away!! How great! I knew it was German and figured it was there but wasn’t sure. Thanks! This sounds delicious! You can probably make mini ones for a party or something. Thank you! Yes! That would be a great idea!